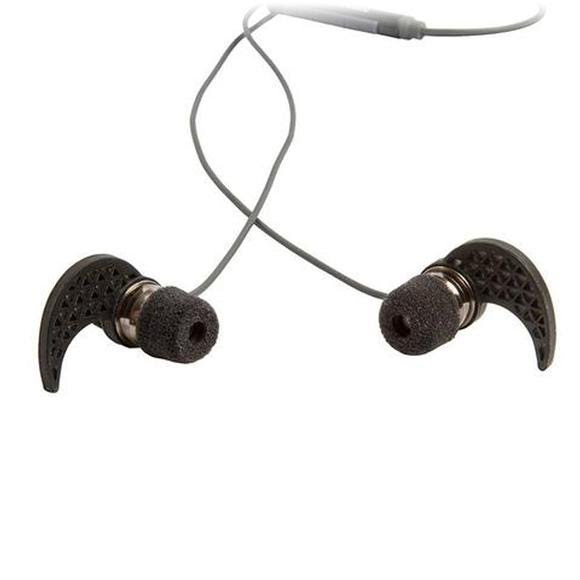 From the open water to the gym to the gymkhana, the Makos offer a secure fit and apex predator sound quality in a sweat and elements resistant design. Don't be fooled by the Makos' small size, they pack a big sound. Crystal clear, Hi-Fi sound with solid bass pumps out of the Makos. Even though you might see a mako shark jump out of the water, our Makos will stay securely in your ears. From the open water to the gym to the gymkhana, the Makos offer a secure fit and apex predator sound quality in a sweat and elements resistant design. Don&apos;t be fooled by the Makos&apos; small size, they pack a big sound. Crystal clear, Hi-Fi sound with solid bass pumps out of the Makos. Even though you might see a mako shark jump out of the water, our Makos will stay securely in your ears. We paired the Makos with Comply foam tips and the Makos fin. Both work together to stop your earbuds from popping out when head-banger fire comes across your playlist. A 3-button in-line universal remote gives you control over track, volume, calls, play/pause, and activates your digital assistant (like Siri), while the heavy duty tangle-free cable keeps your life simple and free. We also put an omni-directional microphone on there too. So when the call comes in (and it will come in) to ask if you want to go on a burrito tasting vacation, you answer the phone, speak slowly, and say YES!